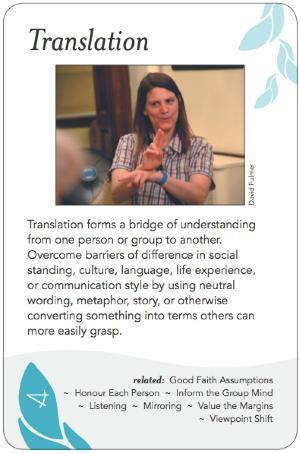 Translation forms a bridge of understanding from one person or group to another. Overcome barriers of difference in social standing, culture, language, life experience, or communication style by using neutral wording, metaphor, story, or otherwise converting something into terms others can more easily grasp. Translation is one of the key roles of a facilitator. If you are working with a group that is totally new to being facilitated, you might need to explain this as part of your opening. By translation in this case we don't mean literally exchanging, say, words in English for words in Korean, rather we mean taking an expression that was not understood clearly and helping get the message across. Not everyone in a group is equally articulate. If a member says something and people look confused or you have the sense that not everyone in the group understood what the person was trying to express, you might "translate" it by restating it for the group. Sometimes this is done as part of Mirroring, that is, reflecting back to the speaker what you think you heard them say, while witnessed by the rest of the group. Often the ideas of people with lower status in a group are not given as much consideration as those of higher rank, so by translating or restating the content or main point of what was said, the facilitator helps lend credibility to someone's contribution. Another time for using translation is when someone expresses themselves using terms that are highly charged. If you are facilitating a discussion about abortion and someone uses the term "baby-killing," you might translate that as, "It sounds like [name] is deeply concerned concerned about loss of life." The aim is to find substitute vocabulary that doesn't censor and gets the idea across in a manner where it's more likely to get heard. Sometimes translation can also be going from the surface words into the energetic intent underneath the words, or using a metaphor to help one group grasp the situation of another group. "I'm not sure I understand. Could you please explain that another way?" "Just so I understand, are you saying that....?" "Is everyone clear on what (the current speaker) is saying?" "Could you give us an example to clarify what you're saying?" Knowing the history of a group makes your translations much more likely to be effective. Be aware that what is a neutral word or expression in one group could become a very loaded word in another, or you could inadvertently stumble into a minefield. Sometimes it's you who doesn't understand accurately what someone said; after you attempt to translate, check in to see if you got it right, and remember that other people are the authority on their own experience. Above all, beware of putting words in people's mouths. avoiding negative attribution, stereotyping, and other forms of communication likely to raise the listener's defenses. Some consensus methods use holding up a yellow card as an unspoken message to the speaker that a group member is confused or uncertain what is being said, or has a question. Nonviolent Communication (aka Compassionate Communication) focuses heavily on translating from judgmental terminology into compassionate or neutral terminology. Don't Just Do Something, Stand There! (Weisbord & Janoff) chapter "Find Common Ground" is relevant to this. --or move to Reframing?